LaSpada Audio is a new speaker company out of New Jersey offering three new speakers: The BL-a Bookshelf Monitor, the BL-MM-a 2-way reference monitor, and the BL-MTM-a 2.5-way large monitor. 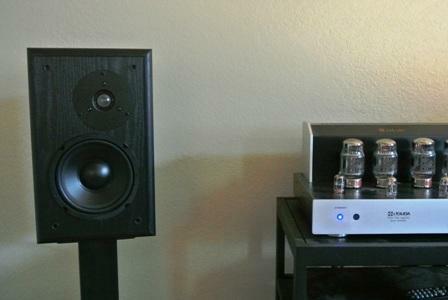 The smaller BL-a Bookshelf Monitors are the subject of this review. The design seems ubiquitous, a two-way speaker housed in a black box with vinyl finish and vented in the rear. However familiar the design, the BL-a Bookshelf Monitors are well executed. The speaker cabinets are solid with sharp corners and tight seams, and house a 6.5 inch polypropylene cone and 1 1/8 inch silk dome tweeter, set off-center. Frequency response is stated as 38 Hz – 20,000 Hz. Power handling is 5 to 125 watts. Speaker cables are connected via sturdy 3-way insulated connectors. The short but informative manual suggests the tweeters be aligned on an inside orientation. Grills are included. I had the BL-a Bookshelf Monitors set-up in my second system located in my den, which is approximately 12 x 14 feet. They were powered by my modified Jolida 502 BRC integrated amp. Source components included an NAD CD player and NAD tuner. I used LaSpada's own brand of 12-gauge speaker cables running to the amp. The manual suggests the speakers be placed at least 6 feet apart and at least 1 foot from the rear wall, which is exactly how I had them set-up. The sound of the BL-a Bookshelf Monitors is improved by removing the grills, and I think the speaker looks better without them. I set them on top of 20 inch tall steel stands filled with kitty litter to add weight and reduce resonance. The LaSpada Audio speaker 12-gauge speaker cables use Nakamichi connectors which made a secure connection to my amp. I am a fan of speakers that can throw a wide and deep soundstage. Small speakers are particularly adept at this feat, but typically lack sufficent bass response to satisfy me. However, when I first played music through the BL-a Bookshlef Monitors I was pleasantly surprised. Not only did they cast a wide and deep soundstage, but they were balanced with enough bass to provide a satisfying foundation to every musical genre I played. Katie Melua's Pictures album sounded wonderful through the BL-a Bookshelf Monitors. Highs were detailed without being harsh, and the mid band was rich and informative. The tone of Melu's voice sounded natural and the speaker conveyed the essence of her dark, jazz influenced voice. She hovered in a stable center image and instruments played to the left and right of her in their own separate and distinct space. At times the center image was so stable it sounded like it was coming from a center speaker speaker in the home theater set-up. Piano was equally detailed and had presence, notes sounded full then decayed into the next. Music had a cohesive quality when played through the BL-a Bookshelf Monitors, and I could not detect the crossover point between the tweeter and bass driver. For example, Wings of Desire by Marketa Irglova features well recorded violins and piano, eventually joined by drums. Hard as I tried I could not detect the speaker's cross-over points on this, or any music I listened to during my time with them. 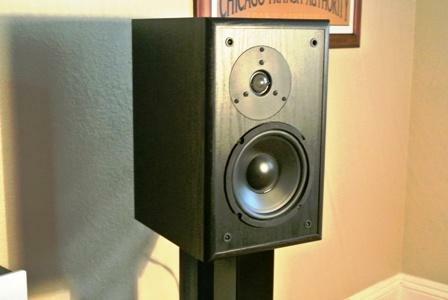 The seamless integration of tweeter and bass driver makes the BL-a Bookshelf Monitor sound like a single driver speaker. There is no denying the laws of physics and a 6.5 inch driver can only move so much air, but the BL-a Bookshlef Monitors played reasonably loud while they maintained their composure. On Pearl Jam's Yellow Ledbetter, I could hear lead guitarist Michael McCready work the fingerboard of what I assume is a Fender Stratocaster. Drums sounded punchy, tight and fast while Eddie Vedder mumbled unintelligible lyrics front and center stage in between my stereo speakers. I did not miss my Martin Logan Dynamo subwoofer I normally use in this room, and if you use the BL-a Bookshelf Monitors in a reasonably sized room I don't think you will need a sub either. The speakers have a slight midrange hump, but it is slight. The 6.5 inch drivers can pump like a little trampoline and move enough air to provide surprising bass authority for a small speaker. Comparing the BL-a Bookshelf Monitors to every speaker in its price class seems impossible there are so many, but I am familiar with a few including Pioneer's SP-BS22-LR, Paradigm Atoms and Energy RC-10. If I were buying I would opt for the BL-a Bookshelf Monitors. The others are fine performers, but in my experience each requires a subwoofer to get satisfying results. The BL-a Monitors do not need a sub and as a consequence offer more cohesive sound particularly listening in the near field. Further, the off set tweeter has an advantage of being able to tune the speakers by swapping sides to see which set-up sounds best in your room. The LaSpada Audio BL-a Bookshelf Monitors are one of those rare products which make it possible to get a taste of high end audio on a budget. They cast a wide and deep soundstage and have surprisingly full balanced sound with detailed highs, rich midrange and punchy bass. 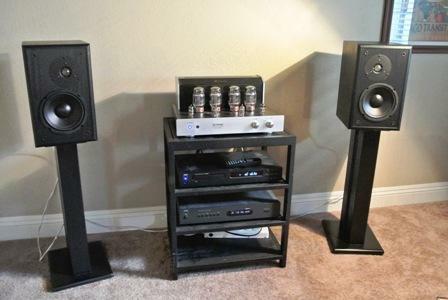 Their performance exceeds that of similar products from established manufacturers, and if you are considering speakers in this price range for stereo or home theater you would be well served to put the BL-a Bookshelf Monitors on your short list of must audition speakers. Highly recommended. Go to the review of the LaSpada BL-MMa reference monitors.